Today we use maps with ease. Google Maps or other such programs allow us to find directions to any place and virtually anywhere at the tap of a finger. Using Google Earth we can fly above the world and explore our world's coastlines and mountains or even the still waves of the open ocean's vast kilometres. The accuracy of these maps would have astonished someone even twenty years ago – let alone a visitor from the pre-digital age. Maps are more than just a set of directions or a hunt for accuracy. They are forms of communication as much as writing. Today we look at maps and the worlds they create for us. Before we were able to create the detailed maps we find on our smart phones, maps were likely to fulfil Arthur Jay Klinghoffer's insight in The Power of Projection that "maps are not reality, but interpretations of it. They are made for a purpose, and they incorporate a great amount of human subjectivity." Centuries ago less accurate maps represented a world that may differ for ideological reasons (like religion), military necessity, or political and economic gain. Different types of historic maps fulfil different purposes. Luckily for the curious, there are many depositories of historical maps online, some of which we are going to examine today. Some maps are distorted by necessity, but those distortions in turn affect how their viewer perceive the world. 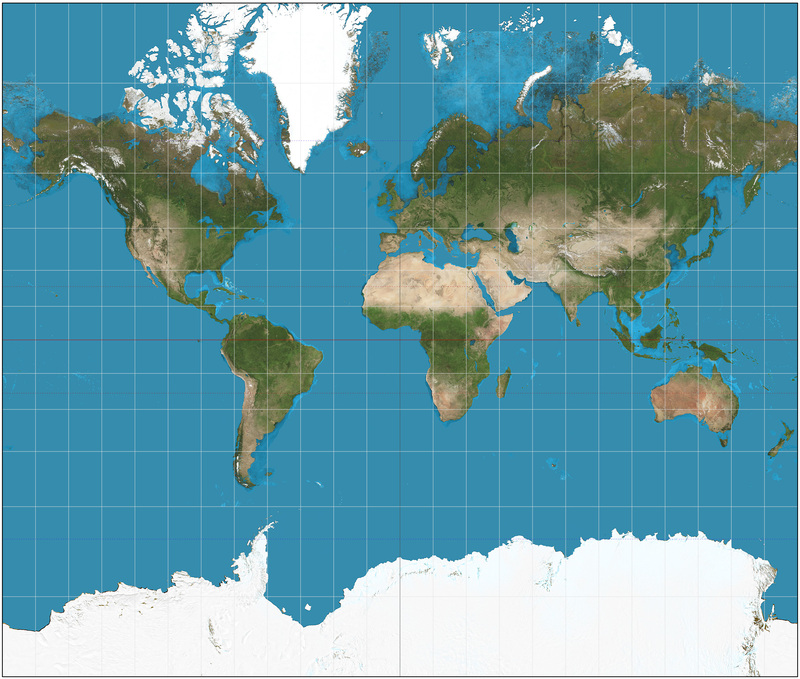 A mercator projection is the projection which may look familiar to many of our readers. Since it is a flat square representation of a sphere, the Earth, it distorts the poles which should come together at the top, but are instead artificially stretched. Greenland is not in fact the size Africa, nor is Brazil smaller than Europe. If you do not realize the extent of the Mercator distortions, you might conceive of the world's continents at very different sizes than what actually exists. The Mercator projection is useful since it creates a grid of straight lines for travel, but as Klinghoffer warns, maps are not reality. The T and O Map or orbis terrarum (orb or circle of the lands) were called such because they were usually round (O) and had a horizontal diameter perpendicular to a lower vertical radius (T). They were essentially a Christian conception of the world and were common through from the 8th to 15th centuries. Jerusalem was at the centre and there were 3 continents, symbolizing the Holy Trinity. They had an eastward orientation (east is up on the map instead of north), with the vertical part of the T being the Mediterranean while the Nile and the Don (sometimes the Danube) river made up the crossbar of the T.
We can link this map to Christian scripture rather than a misguided attempt to accurately recreate geographic features. The east orientation refers to Genesis 2:8 "And the Lord God planted a Garden eastward, in Eden." Thus paradise (Eden) was to the East. Jerusalem is at its centre since in Ezekiel 5:5 it says "Thus saith the Lord God: This is Jerusalem! I have set her in the midst of the natives, and countries are round about her." Equally, it was predominantly land and not water because in Ezra II 6:42 "On the third day you commanded the nations to be gathered together in the seventh part of the earth, but the six parts you dried up and kept them so that some of them might be planted and cultivated and serve you." We would not consider the map accurate by any means, but within the knowledge base of Christianity at the time, it was an correct facsimile of the larger world. One of the most famous (and beautiful) T and O maps is the Hereford Mappa Mundi You can see for yourself in this larger version the T and O features described above. It's been debated whether or not this map is meant to be an aid to travellers, or instead was simply a work of art like a stain glass window. Note Christ passing judgement at the top of the map and the clear separation between the perfect celestial world and the imperfect terrestrial world. Again, the map was not used so much for its depiction of the globe, but rather as an accurate depiction of the Christian world. Maps' accuracy also sometime changed from military necessity. For instance, the Soviet Union would distort published maps of their country to prevent accurate bomb attacks. This included altered coastlines and latitudes and longitudes, slightly moved rivers, bridges and railroad hubs, or towns on the opposite back of the river to where they actually were. This site shows a picture of the New York Times from September 3, 1988, when due to emerging satellite technology the Soviets admitted to their duplicity. Japan is also historically known to have closely guarded maps of their island nation to foil military invasions. In 1826 the Japanese court astronomer, Takahashi Kageyasu, met a German doctor named Philipp Franz von Siebold who had been dispatched to Japan three years earlier as a medical teacher and surgeon. He was also tasked with returning with a report on Japanese scientific knowledge and the viability of Dutch/Japanese trading. 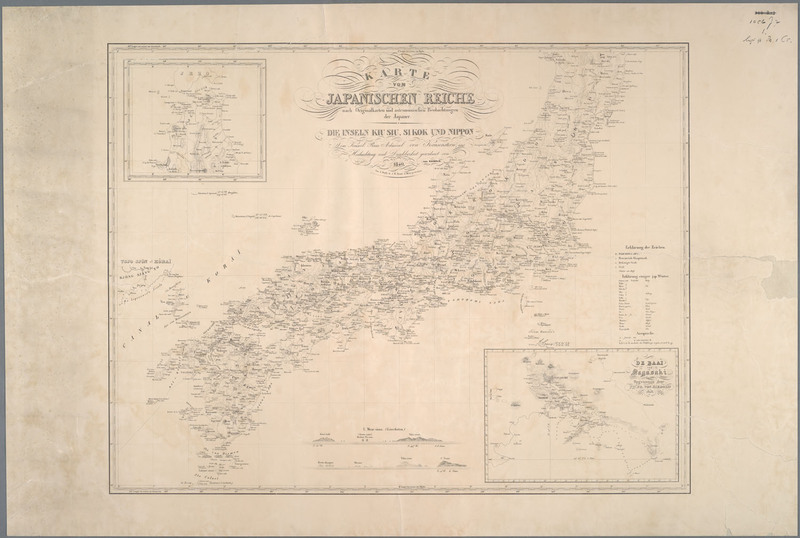 Takahashi wanted Dutch translations of the works of English and Russian explorers from Siebold, but in return Siebold asked for a copy of Ino Tadataka's map of Japan. Kageyasu agreed and shipped them to Siebold in Nagasaki, but a typhoon wrecked the ship and in the wreckage Japanese authorities discovered the maps. Kageyasu was arrested and died in prison in 1829, then his corpse was immersed in brine to preserve it until the verdict. When it came in 1830, his corpse was was found guilty and subjected to the sentence of beheading. Siebold was expelled from Japan and forced to relinquish the maps he had in his possession, but he had already made duplicates. He smuggled them out safely since Dutch-Japanese agreements only allowed for the inspection of incoming ships. As a result, Siebold was able to produce some of the earliest accurate maps of Japan for Europeans. American Commodore Mathew Perry was aided by Siebold's maps when he arrived to "open" Japan to the West in 1854, which eventually resulted in the end of the Shogun era. Perhaps obviously, maps serve as political tools. Prior to the 1648 Treaty of Westphalia, European maps did not emphasize political boundaries. The Treaty that ended the Thirty Years War set up the foundation of European international relations and also began the process of setting stricter state boundaries between the kingdoms of Europe. Whether a map showed the “correct” boundary was easily open to interpretation or sometimes required a more forceful correction with the use of an army. Whereas more general maps tended to present a “reality” where disparate people were grouped together, maps with defined boundaries tended to separate them and accentuate political, religious, or ethnic division. For example, take this map from 1821. It divides the world by government, degree of “civilization,” and population. To us it clearly demonstrates the faulty worldview of early 19th century Europe, yet to a contemporary this would have been as informative as Google maps is today. Nor do maps always have to be wedded so strictly to geography. One of the most famous maps is Charles Minard's Flow Map of Napoleon's Campaign into Russia. The thickness of the tan lines represents the size of his army when the campaign began, with various smaller forces breaking away as they marched towards Moscow, and the black lines traces their retreat. These lines are imposed on the rough route of the French armies, and below it traces the temperature they encountered. In a simple depiction, we can understand where Napoleon's armies went, the date and casualties of battles, the impact of winter, and their ultimate failure when they reached Moscow. Another wonderful example of unconventional maps (to most of our readers, we presume) are the Marshall Islands' stick charts. At first glance they seem meaningless. Yet these simple abstract collection of sticks are key to understanding the Pacific currents that allowed Marshall Islanders to travel the ocean. To us, these maps are essentially useless. To those who understand the language they are using to communicate, they are as clear as any Rand McNally depiction. Maps offer all sorts of different visions of the world. How they communicate their information changes the meaning they convey. Like writing, they too are bound by cultural knowledge – few Christians would have appreciated an O and T map outside of medieval Europe, and we are befuddled by the stick charts of the Marshall Islands. So remember next time you are tapping away on your GPS or Google Maps that you are seeing an interpreted world, and maybe ask how that changes what you see.